This question type allows the user to change the language of the survey. Users can choose from a dropdown list, the language in which they wish to have the survey questions displayed. The dropdown list includes the base language (which is selected when the survey is created for the first time) and the additional ones (they can be edited from the general settings panel). 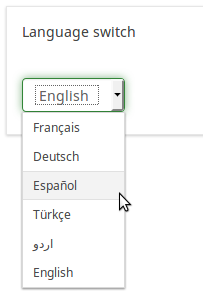 Note: LimeSurvey also shows by default a dropdown list with the available languages on the welcome page.